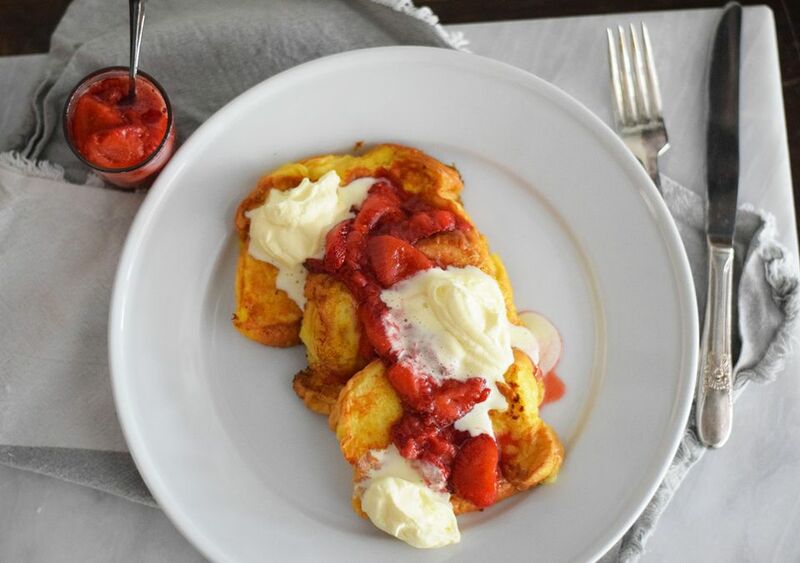 If you're a fan of French toast, then you are going to enjoy this decadent recipe for brioche French toast. How do we know? Because it has a special strawberry compote and lemon curd whipped cream that it's served with. Yum! Store-bought lemon curd works great, but if you have time for homemade lemon curd, that's even better. The homemade whipped cream is a must and is way easier to make than you think. It only takes a few ingredients and it's much tastier than the store-bought stuff. This is the perfect French toast for Mother's Day, Father's Day, or another special breakfast or brunch. It can also be prepared like a French toast bake. Just assemble the brioche slices with the egg mixture in a buttered casserole dish, pop it in the oven for 45 minutes, and serve. No standing by the stove needed! You can also make it ahead of time and pop it in the fridge until you are ready to bake. We always enjoy a make ahead breakfast. After slicing the brioche, whisk together the eggs, milk, heavy cream, vanilla extract, sugar, and lemon curd in a large casserole dish or another dish that you can use to easily dip the brioche slices. Then set aside while you make the toppings. Make the strawberry compote by adding the strawberry slices, sugar, and vanilla to a small saucepan. Bring the mixture to a boil, then reduce to a simmer, stirring occasionally until the mixture thickens, about 15 minutes. Cover and set aside to keep warm. For the lemon curd whipped cream, place the heavy cream in a large bowl. Whip the cream with a hand mixer until soft peaks form. Add the powdered sugar, lemon curd, and vanilla extract. Beat again quickly to incorporate. Do not over beat after this stage as the heavy cream will form butter instead of whipped cream if over beaten. Cover and place in the refrigerator until just before you are ready to serve. Grease a large griddle with the butter. Heat it on high heat and then turn it down to medium low. Dip the brioche slices in the egg mixture, coating both sides. When dipping, allow the bread to sit for 30 seconds per side so it can soak up more of the batter. Place the bread slices on the griddle and cook 2 to 3 minutes per side or until golden brown. Remove from the heat and serve immediately with the strawberry compote and lemon curd whipped cream.